Pop into SHOP Monday thru Friday to meet one of our Contraceptive Educators! 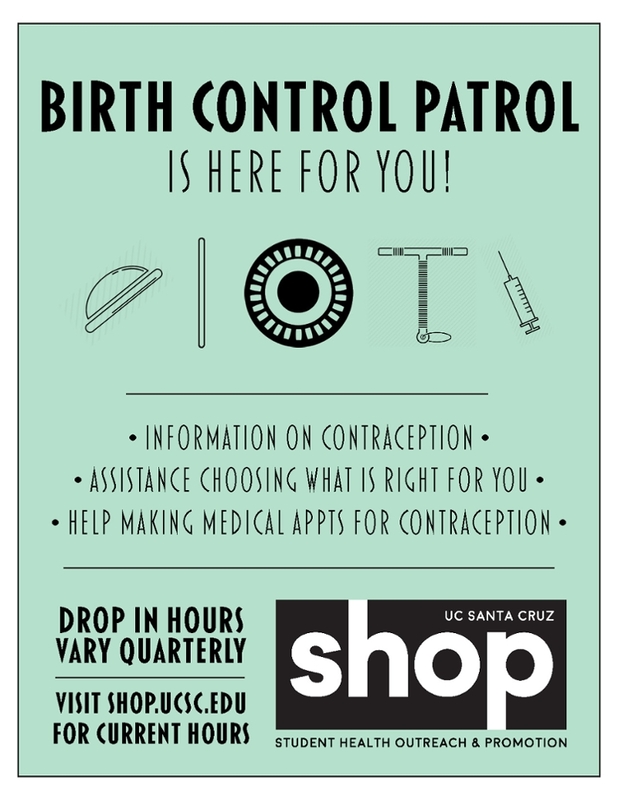 Birth Control Patrol is an anonymous drop-in resource offered at SHOP throughout the week. Highly trained students can offer information on contraceptive options and assist students in making appointments at the Student Health Center (with UCSHIP) or assist in finding health clinics off campus if they don't have the Student Health Insurance Plan. Additionally, SHOP is here to support students and their partners around preventing pregnancy. This peer to peer service is here for you! SHOP provides pregnancy tests for $3.00! SHOP has resources for students who are dealing with a unplanned pregnancy.